As I've mentioned in my last couple of blog posts I had my baby five weeks early and was caught totally off guard. The day before I went to hospital we had our car seat installed, and exactly one week before I had my baby shower. So we were set for a means to get her home, and clothes to wear, but I wasn't so much prepared. Amidst moving and working I really hadn't got to check much off my to do list and having my hospital bag all ready to go was one I wish I had of got around to. Because I ended up needing it a lot sooner than expected! I had started to pick up a couple of things each time I went to the shops and had them sitting in an enviro bag under my stair case near the door, but that was as far as I got. I didn't really know what I needed, or what I should have packed, but over the course of my stay all of these things were eventually brought to me. So I decided to put together a little post to help you out if you're getting around to packing your hospital bag and were unsure like me as what to take with you. 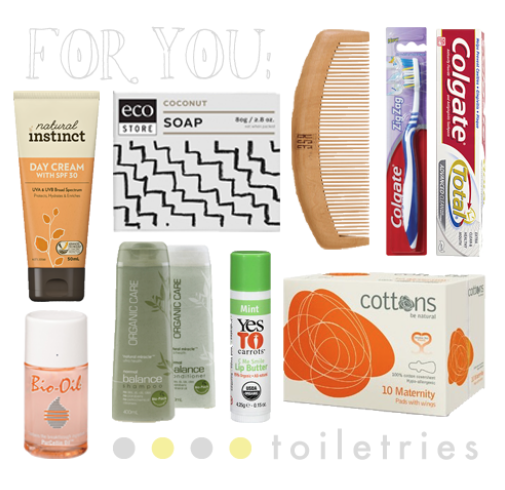 Aside from packing your every day toiletries, there are a couple of things that I would highly suggest you take with you. Like some Bio Oil, or some sort of oil or belly butter to rub on your stomach while you're in hospital. I went into hospital without a single stretch mark in sight, and ended up bringing more than I would have liked to home with me. I don't really know why this happened, but after talking to my sister she mentioned how this had happened to one of her friends. So if it is a common thing, try and avoid it if you can and pack some oil and rub it on after your very first shower! Not only will your face be really dry, but your lips will too - so pack a good lip balm! I had a tube of organic paw paw + honey as well as my go to Yes To Carrots lip balm and kept them both close to me. I had no idea what to pack to wear in hospital, I just thought I would wear a nighty for the couple of nights I was there. And for the first two or three days that is what I wore, but after that I was desperately wanting to end my pyjama party. T shirts and tights were a great option as they still felt really comfortable like pyjamas, but were on the day casual side of clothing. The maternity band on the tights felt like magic on your tummy because you're still really tender and it was nice to have something covering your tummy area. Especially if you've had a caesarean they're great because they won't be sitting on your scar area. When I first thought to start buying things to take, slippers were one of the first things I picked up and I'm really glad I took them with me. I really don't like walking around in bare feet, not even in my own house, and the slippers padding came in handy when getting up and down from seats. I had no idea what I needed to take for the baby, the only thing I had in my bag of things were some baby wipes. When Romy was brought into me in her little cot the hospital had provided us with a handful of nappies and some blankets, and after they were gone it was up to you to get your own. In the last month I've tried a couple of different brand nappies and would recommend the Huggies Newborn nappies as I felt they were the most effective. They also have a wetness indicator so you don't have to undo the nappy to check if its wet. My lovely cousin Sophie came to visit me and she thoughtfully brought the Gaia Baby Starter Kit which has massage oil, shampoo, bath + body wash, soothing lotion and moisturiser. Don't forget to pack a few different singlets and jumpsuits as it only takes one feed to mess them up! And lastly, the hospital has baby blankets, but after a few days it was nice to have our own on her, so chuck a couple of those in too! if you packed something I didn't include and would recommend to other ladies, be sure to leave a comment. It might help me out for next time! we've been using huggies and gaia since Violet was born and let me tell you, we've tried plenty of other stuff but those are the two best brands. Other baby washes are too drying on either the skin or the hair, i've found. Even other organic ones, like Milk. I think those lists are perfect! The only thing I'd add is books and/or ipad/laptop with movies or an ipod for music. Especially if you have to stay longer than 2 nights. And headphones for in case you have to share a room. Interesting story: when I had Violet 2 years ago the hospital supplied the nappies and wipes so with Beatrix we didn't take any. Things have changed (budget cuts I guess) and Rob had to go out and get supplies after they grudgingly gave us a couple of nappies put her in immediately. I bought a pre packed bag from www.maternitybag.com.au , they even have Pj's and socks all included! I have since bought their baby bags for my girlfriends as the bag was a blessing!